​What separates IT organizations that deliver transformational, game changing value from all of the others? And how can your organization rise to the top in today’s competitive, disruptive environment? 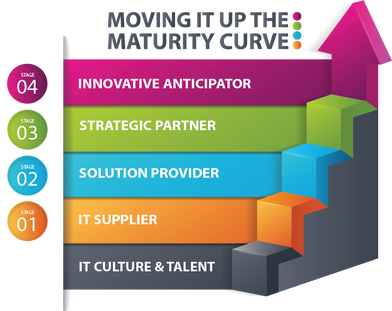 Join us for Unleashing the Power of IT - Moving Your Team Up the IT Maturity Curve. This exclusive one-day workshop is designed specifically for leaders of IT talent, including CIOs and IT leaders who are committed to developing their people with the new core skills needed for success today. Discover our three most popular topics relating to the human side of technology. Learn simple yet elegant models, apply learning to real situations, and receive strategies and techniques that you can use immediately. Ouellette & Associates (O&A) developed the IT Maturity Curve based on a year-long study with Babson College, uncovering a new stage of maturity, the “Innovative Anticipator” — where IT goes beyond partnering with the Business and actually leads the business. When we asked CIOs of high performing IT organizations for their “secret sauce”, they pointed to 14 core competencies that focus on the human side of technology. the right things to the right clients at the right time. Marketing IT’s Value: Help your IT organization focus on benefits and solutions, not features and products. Develop a process for building a marketing plan that can be tailored to your unique needs. Call today to reserve your place!! Call 800.878.4551 or email tdinu@ouellette-online.com to reserve your spot today! Ask us about bringing these workshops in-house! ​O&A develops the Human Side of Technology. We are changing the conversation about IT strategy, culture and talent by employing the new "core" competencies and an attitude of "we ARE the business."